Intricate gold filigree covers this turquoise pendant necklace by Shlomit Ofir Jewelry. Israeli jewelry designer Shlomit Ofir continues to play with metal and filigree elements in this unusual long gold necklace that is sure to be a statement piece of jewelry. 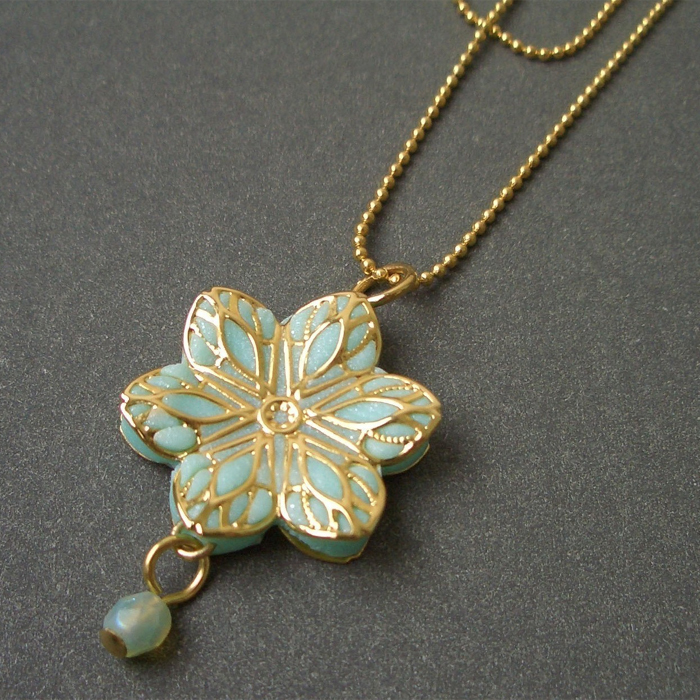 A 6-petal flower pendant of polymer clay, worked by hand to resemble turquoise stone, hangs from a long gold-plated chain worked in bead style. The turquoise colored clay is bound by two handcrafted filigree elements in gold plate, which embrace the cool blue of the pendant with fine, curving vine-line designs. The cool tones of the clay and glass bead set off the warmth of the gold pendant. The pendant is accented with a single glass pearl bead suspended form the bottom. Shlomit Ofir's handcrafted jewelry makes a wonderful gift for anyone who loves fine handmade pieces in gold and silver plate and a great addition to any collection of modern Israeli jewelry and designer jewelry.